Find the right tour for you through Kala Patthar. We've got 40 tours going to Kala Patthar, starting from just 10 days in length, and the longest tour is 21 days. The most popular month to go is May, which has the most number of tour departures. 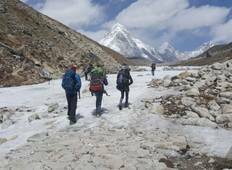 "If you are looking for a friendly, trustworthy, good value trekking company for your..."
"We group of four friends had been planning for Nepal trip since last year. I must..."
"What a fantastic experience!!! Mountain Kick did an excellent job setting up our..."
"Everest base camp trekking is the most adventure treks in the world. last year we..."
"We are just back from trek. 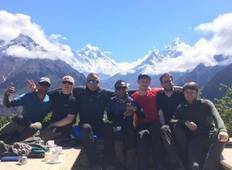 I am overwhelmed by the beautiful mountain views and..."
"We experienced hiking to Everest Base Camp which has become a trip of lifetime. From..."